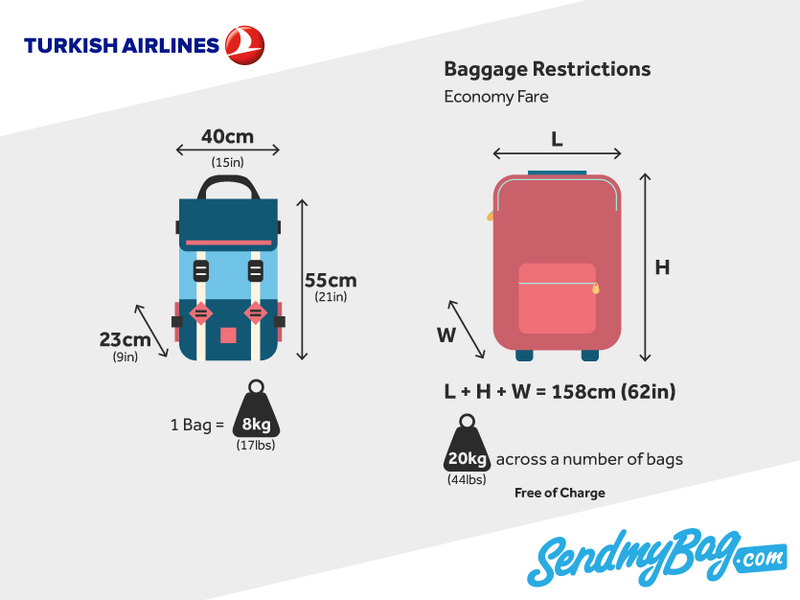 If you need to bring several bags to your destination, the Turkish Airlines baggage allowance may not be enough for you. You may also wish to avoid the airline’s hefty excess baggage charges. Why not send your luggage to your destination to allow you to pack everything you need, avoid unexpected charges AND travel light and stress free! Get a quick quote now. Economy customers may bring 1 x 8 kg/ 17 lbs bag into the cabin. Business Class customers are permitted 2 x 8 kg/ 17 lbs bags. The size of each item may not exceed 55 x 40 x 23 cm/ 21 x 15 x 9 inches. Musical instruments can be carried on board the aircraft if their total dimensions do not exceed 118 cm. A cello can be transported in the cabin on payment of a cabin baggage fee, if its dimensions do not exceed 140 x 42 x 25 cm and it weighs less than 75 kg. You must make a reservation for transporting your cello at least 48 hours in advance. On domestic flights passengers may check 15 kg/ 33 lbs on promotional deals, 20 kg/ 44 lbs in Economy and 30 kg/ 66 lbs in Business Class. Checked bags must not exceed 158 cm/ 62 inches in total dimensions, nor weigh more than 32 kg/ 70 lbs. On international flights that operate a weight concept, the free allowance is 20 kg/ 44 lbs in Economy and 30 kg/ 66 lbs in Business Class. On international flights that operate a piece concept passengers may check 2 bags at 23 kg/ 50 lbs each in Economy and 2 bags at 32 kg/ 70 lbs each in Business. Turkish Airlines excess baggage charges for domestic flights are 8 Turkish Lira per extra kilogram. Excess baggage fees for international flights using the weight concept depend on which regions (1-4) you are travelling between. Fees range from EUR 8 to EUR 32 per kg of excess luggage. Excess baggage fees for international flights based on the piece concept go from USD 160 per extra piece to USD 360 per extra piece. If your flight contains a stopover in Turkey, you will need to calculate the cost for each leg of your journey. Note that on certain routes the cost for an extra piece of luggage increases with each additional piece of extra luggage, maxing out at 8 extra pieces. For example, on a flight between Niamey and Dubai 1 extra piece would cost USD 200, the 2nd piece USD 250, and so on, until you reach 8 extra bags. This 8th bag would cost USD 750, in addition to what you would have to pay for extra bags 1 - 7. Infants have a 10 kg free checked baggage allowance when travelling with Turkish Airlines. A car seat can also be checked for the infant, free of charge. Looking for Turkish Airlines sized hand luggage?